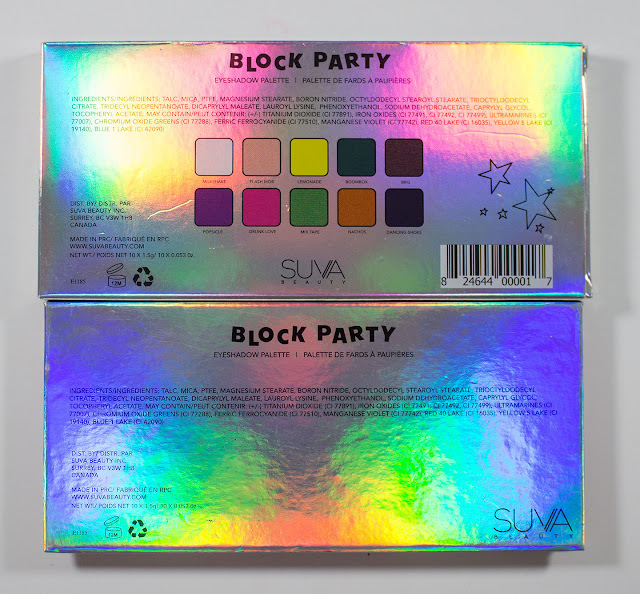 SUVA Beauty Block Party Palette. 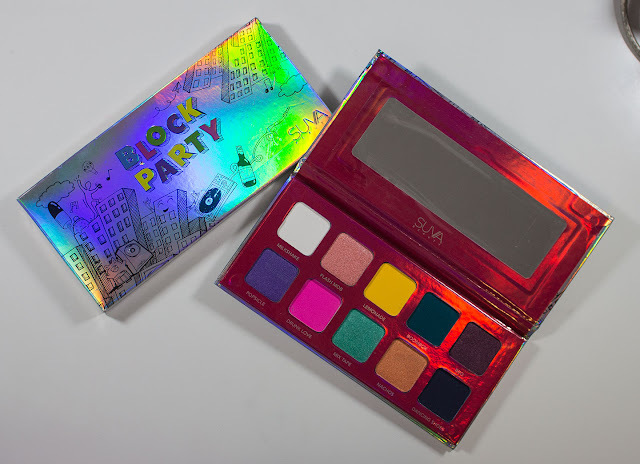 The SUVA Beauty Block Party Palette retails for $30US and $38CAN for a 10 X 1.5g/0.053oz of eyeshadow product. I did get this palette for $30 CAN at IMATS this year. 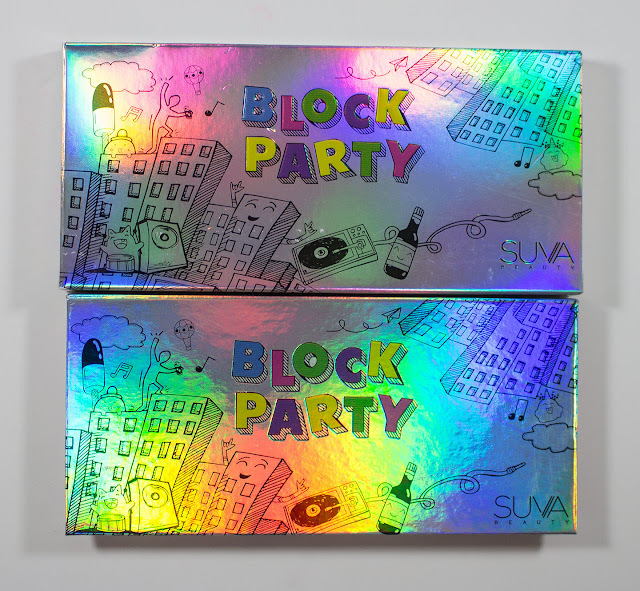 SUVA Beauty Block Party palette and box art front side. SUVA Beauty Block Party palette and box art backside with ingredients. SUVA Beauty Block Party Palette in Milkshake, Flash Mob, Lemonade, Boombox, BBQ, Popsicle, Drunk Love, Mix Tape, Nachos, & Dancing Shoes. The Matte shades are on the slight powdery side with excellent pigmentation and blendability. Most shades are smooth, but the shades Boombox and Dancing Shoes is a dryer formula due to their higher pigmentation. 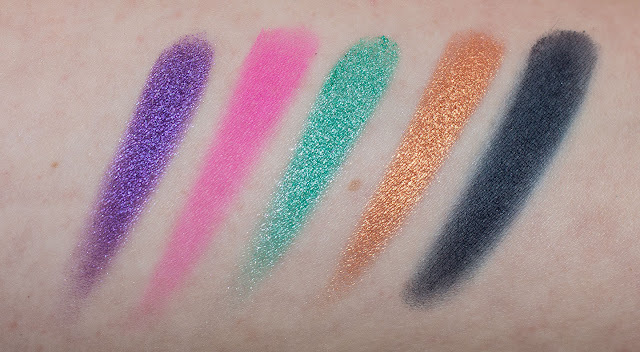 The shimmer shades do pack a punch regarding pigmentation, and the texture is buttery which allows you to sheer out nicely as needed but also intense enough to last on the skin. Milkshake is a pure white with a matte finish. This shade is slightly sheer but builds ups over a primer. Flash Mob is a peachy light pink with a shimmer finish. Lemonade is a true yellow with a matte finish. 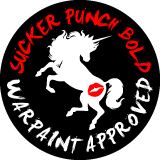 This shade is also slightly sheer but builds ups over a primer. Boombox is a deep teal with a matte finish. BBQ is a deep aubergine with a purple shimmer finish. Popsicle is a bright purple with a shimmer finish. Drunk Love is a hot pink with a matte finish. Mix Tape is a vibrant aqua with a shimmer finish. Nachos is a bright orange with a gold shimmer finish. Dancing Shoes is a deep navy with a matte finish. Packaging: The palette is a basic cardboard box with a magnetic closure. The box art is print over silver and magenta holographic rainbow foil stock on the palette and the shipping box, which looks stunning. ;) I also like how SLIM this palette is even with the mirror this palette is very lightweight. 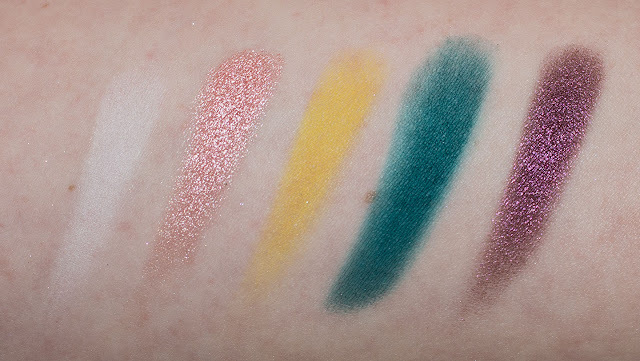 Daylight swatches: Milkshake, Flash Mob, Lemonade, Boombox, & BBQ. 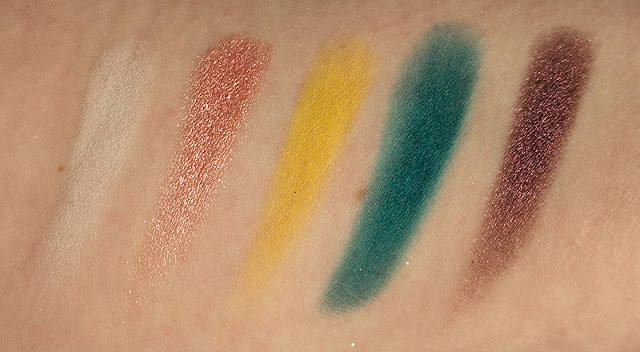 Flash swatches: Milkshake, Flash Mob, Lemonade, Boombox, & BBQ. Daylight swatches: Popsicle, Drunk Love, Mix Tape, Nachos, & Dancing Shoes. 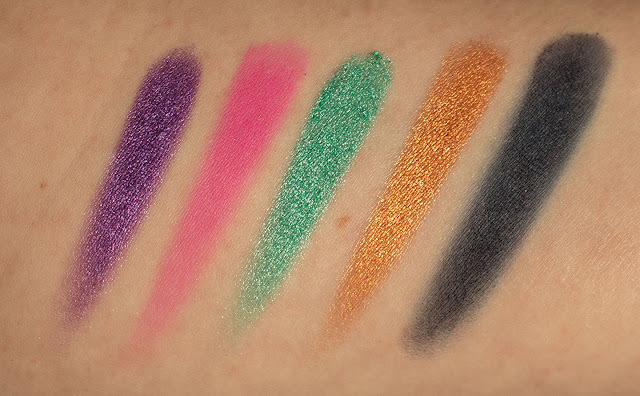 Flash swatches: Popsicle, Drunk Love, Mix Tape, Nachos, & Dancing Shoes. 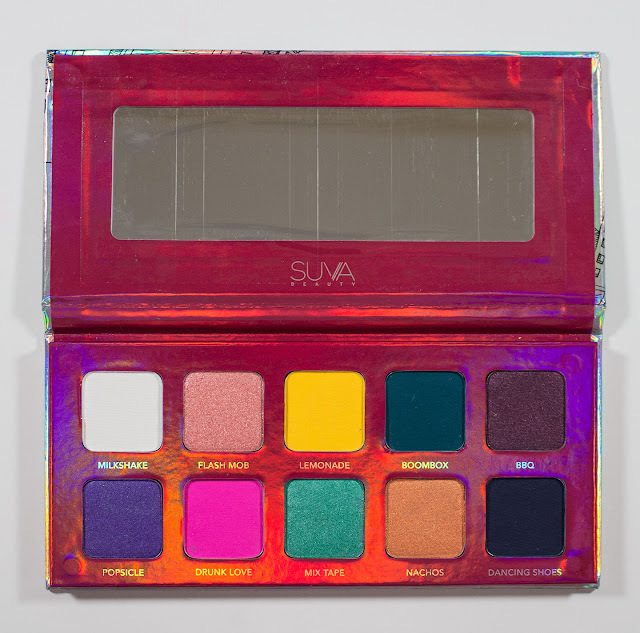 This is a just a fun palette that you will need to pair with blending shades, but there are some nice pops of colour and some on-trend shades that most brands don't bother with in their palettes.